✟ ≠ 35450 Cpl 21 T.M. Battery, R.F.A. 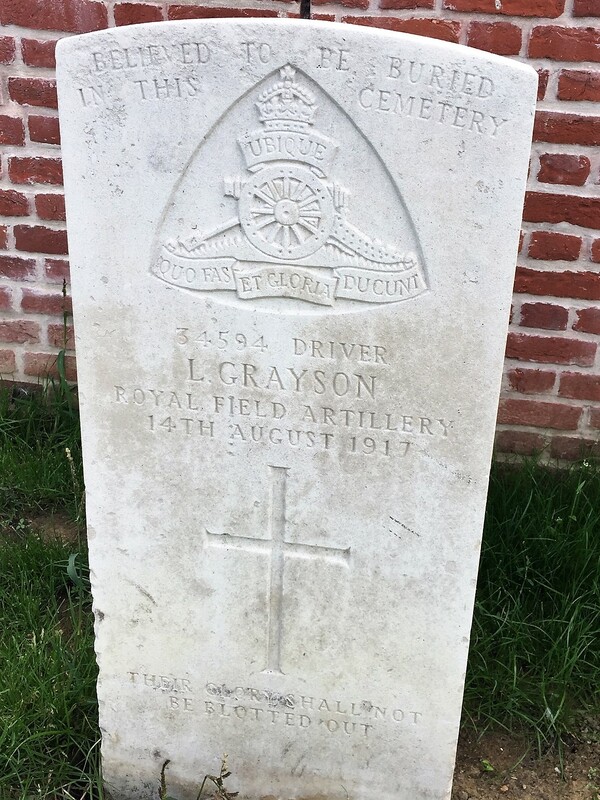 Died 21/3/1918. Remembered at Pozieres Memorial, France. b 1894 Hathersage. 1901C living at 47 The Dale, mother Sarah Ann. The family moved to Alma Road, Tideswell after his father John died (a railway worker) prior to 1911C. ✟ Щ 20084 Pte 2 Bn Northamptonshire Regt. D of W 17/5/1916. (DC 3/6/1916; article says Mr & Mrs Geo Higginbotham, The Dale, Hathersage, informed that their nephew, Pte George Green, Northants Regt, had died from wounds received in action. He was 19 years of age and before enlistment he was employed by the G.P.O. on telephone construction work and formerly lived in the Dale, Hathersage. His parents died some time ago). Grave; Hersin Communal Cemetery Extension. Pas de Calais, France. b 1897 White Edge Lodge, Hathersage. 1901C, 44 The Dale, Hathersage and 1911C, still at The Dale, an errand boy. Son of George, a quarry man, and Hannah. Siblings; Jane, Ellen, Andrew & Grace. A relative was Mrs Agutter of Catcliffe Cottages, Bakewell. 205021 Pte 10/2 Bn Y & L. Living in Woodseats, Sheffield at the time of enlistment. b 1891 “Old Dale“, Hathersage, son of John and Harriet Green, brother of William below (and Edward b 1885 Hathersage and Vivian A b 1888 Hathersage, neither of whom seemed to have served). 1911C, living in Bamford. GREEN, Arthur M.M. (& bar). Щ R.G.A. 96455 Sgt R.F.A. (SDT 9/7/1915 p7; wounded) (DC 27/7/1915; ‘wounded in action in France’). (Belper News 30/7/1915; severely wounded by shrapnel between the shoulders. He is also suffering from pneumonia. He enlisted after the commencement and sent to France about two months ago). (SDT 25/8/16; Awarded the Military Medal in France for conspicuous bravery, by sticking to his gun after all the other men had been put out of action. SDT 12/10/17; For rescuing three wounded comrades, under heavy fire, from a dug out in a recent action, he has been awarded a bar to his medal). b 1893 Hathersage. 1911C living at Thorp Cottage (Pollycroft) Outseats, a railway labourer, son of William and Clara Green. 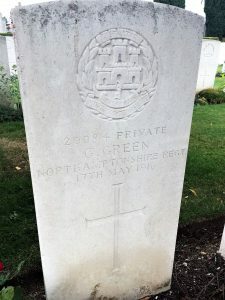 (DC 27/3/1919 ‘At the marriage of Annie Green, Thorpe Cottage, Outseats, she was given away by her brother Sgt Arthur Green M.M.’). In R.F.C. & Ex Emanuel School Western Front Association. R.F.C. details on ‘Air History’ website. There is a reference to him dining in France with Leslie Lincoln Henson, who was a music hall act of some renown. Brother of Donald Worrall Greaves, both appear on Emanuel School First World War Pro Patria, where Vernon is listed as wounded. There was another brother; Edgar Worrall, too young for WW1 but had citation in London Gazette 6/12/1940 suggesting he was involved in WW2. b1893 Sheffield. 1911C living at Padley. Their mother was Nelly b1869 Birmingham and their father, Edward was abroad at time of 1911C but dies 1912. Their mother remarries in 1915 to Hardness Dearden (b 1863 Sheffield). The family must have moved to Castleton as both sons’ medals were sent to The Lodge, Castleton circa 1920. 1944 Hardness Dearden dies at Offerton Hall but none of his money goes to the Greaves family. Mother Nelly dies 1949 in Middlesex. The Dearden family were Brewers; High House Brewery was started by Henry J Dearden, grandfather of Hardness, it was based at Burton Street/Penistone Road, Sheffield. They lived at one time at Jordanthorpe Hall. Hardness sold out to Gilmours in 1901. (Further info; ‘Bygone Breweries of Sheffield’ by Dave/Don Parry available on line or see ‘Sheffield Indexers’. T.A. 1909/ 1910 records, in R.F.C. & Ex Emanuel School Western Front Association. Medal Roll, London Gazette 12/3/1915 made temp 2/Lt. Brother of Vernon E Greaves, see below for family information. Both appear on Emanuel School First World War Pro Patria. b1890 Sheffield. 1911C living at Padley. (Sometimes incorrectly spelt; ‘Graves’). ✟ Щ 1662 Pte 1 Bn Northumberland Fusiliers. Joined up in 1905. He was a member of the British Expeditionary Force to France at the outbreak of WW1, killed 1/11/1914, age 31. Grave; La Clytte Military Cemetery, Belgium, also remembered on Hope War Memorial, (see picture). b c1883 Offerton. He and his brother George b 1875 who fought in the Boer War, lived at Offerton Hall. Charles later moved to Offerton House. 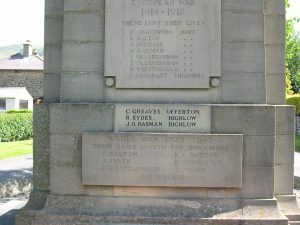 Brother George’s name appears wrongly on Hathersage War Memorial. Their nephew said that at the outbreak of WW1, George disappeared on the moors, and was never found! (DC 2/2/1917, two other brothers, John & Frank Victor H, both born Offerton, were granted farming exemptions). ✟ ≠ 49455 Pte RAMC 132 Field Ambulance Coy. 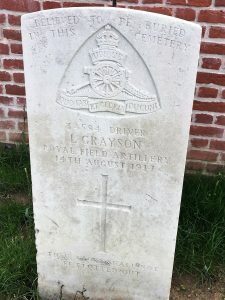 KIA 19/7/1917. 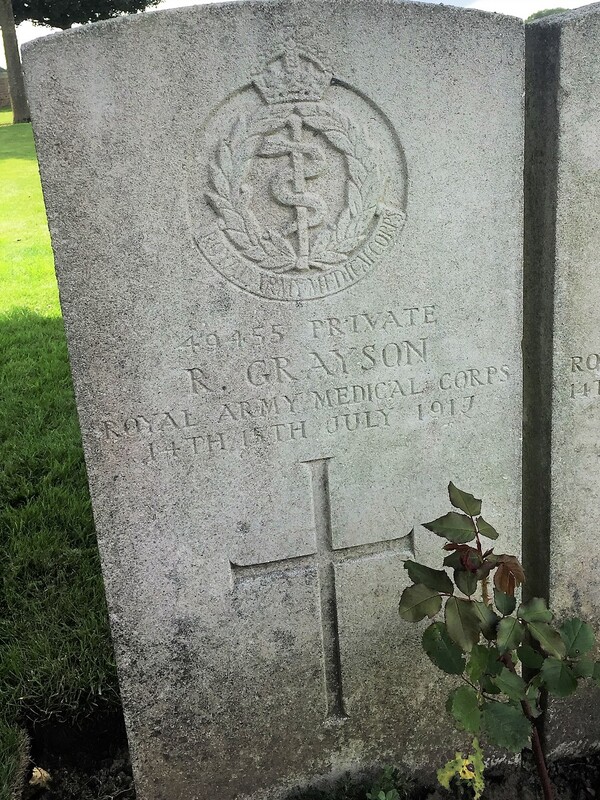 Buried; Gwalia Cemetery, Poperinge, West- Vlaanderen, Belgium. Remembered on Bolton County Borough Roll of Honour. Twin brother of Arthur above, sons of Henry Bagshaw Grayson, b Hathersage 1853. 1911C in Bolton. Both sons b 1894 Duckinfield, 1911C in Bolton. ✟ ≠ Driver L/ 34594 A Battery, 70 brigade RFA. D of W14/8/1917. 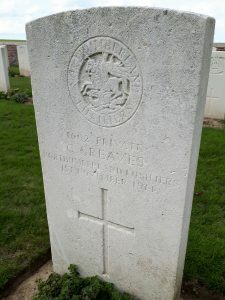 Gravestone in Potijze Chateau Lawn Cemetery, Ypres, engraved; ‘BELIEVED TO BE BURIED IN THIS CEMETERY’. 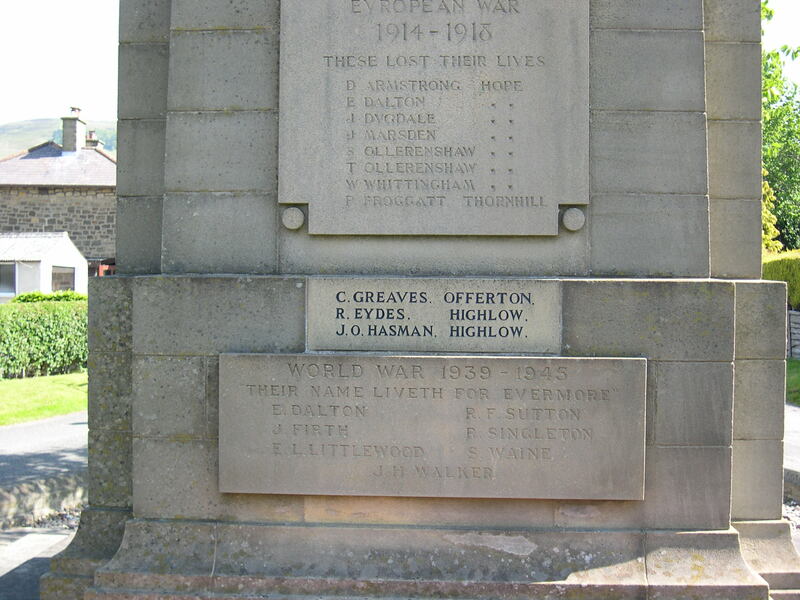 Also remembered at Hurst War Memorial, Hurst Cemetery, Ashton under Lyne. b1883 Duckinfield. 1911C living at Ashton under Lyne, a coal carter. His father was Walter Grayson, b 1856 Hathersage, living 1861C at Brookfield, Hathersage, and 1871C at Sheffield Road, Hathersage. 242269 Pte 2/5 Loyal Noth Lancs Regt. Twin brother of Ralph below, sons of Henry Bagshaw Grayson, b Hathersage 1853. 1911C in Bolton. Both sons b 1894 Duckinfield, 1911C in Bolton.